Barça defeat Alavés 3-0 to kick off the season. 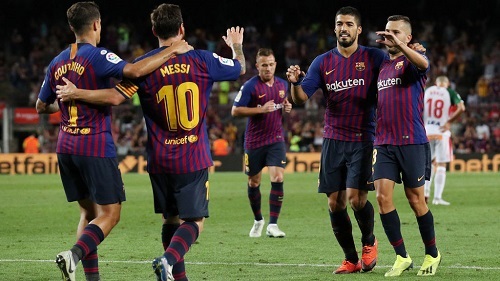 FC Barcelona kicked off the new season as defending La Liga champions with a 3-0 victory over Deportivo Alavés. Captain Lionel Messi scored twice and Coutinho scored the other as the reigning champions started their new quest to repeat as league champions. After playing to scoreless first half, Barça finally overcame Alavés stubborn defensive tactics in the 63rd minute when Messi’s low free-kick snuck under the wall and into the bottom corner. That goal was Barcelona’s 6,000th La Liga goal. Coincidentally, Messi also scored the club’s 5,000th league goal in back in 2009. In the 84th minute, substitute Coutinho scored the insurance goal after collecting the ball on the edge of the area and managed to glide by the Alavés players before blasting the ball for the game’s second goal of the evening. Messi then scored the third and final goal of the game deep into stoppage time after chesting down a superb ball from Luis Suárez before showing composure against his marker before scoring with a left footed shot from the center of the box. Next up for Barça will be an away trip next Saturday when they face newly promoted Real Valladolid. FC Barcelona: Ter Stegen, Semedo (Coutinho, min. 45), Piqué, Umtiti, Alba, Busquets (Arturo Vidal, min. 85), Sergi Roberto, Rakitic, Dembélé (Arthur, min. 75), Messi (c) & Suárez. Deportivo Alavés: Pacheco, Martín, Laguardia, Maripan, Duarte, Wakaso, Dani Torres (Adrián Marín, min. 68), Manu (c), Ibai, Jony (Borja Bastón, min. 68) & Sobrino (Burgui, min. 70). Goals: 1-0, Messi (min. 63); 2-0, Coutinho (min. 84). 3-0, Messi (min. 90+2). Cautions: Dani Torres (min. 9). Previous PostFC Barcelona defeat Boca Juniors 3-0 in 2019 Joan Gamper Trofeo match. Next PostBarça defeat Real Valladolid 1-0 in tough away trip.